South Korean President Moon Jae-in Thursday reaffirmed North Korean leader Kim Jong Un’s determination to comply with complete, verifiable and irreversible denuclearization, after returning from a three-day summit with Kim in the North. Although specifics were not included in a joint statement the two released Wednesday, Moon said Thursday he thought Kim would even demolish additional nuclear and missile facilities that already exist if the United States reciprocates in step-by-step stages. What North Korea wants in return for dismantling the missile engine test site and launchpad in Tongchang-ri and shutting down the Yongbyon nuclear plant is a “political declaration” that war has ended, Moon said. By that, “the U.S. would guarantee regime safety, end hostile policies, then establish a new relationship” between Pyongyang and Washington, Moon told reporters on arrival back to Seoul Thursday. Moon will now gear up for his voyage to New York to attend the United Nations General Assembly next week. Moon and his wife returned to Seoul Thursday from a three-day trip to the North's capital, Pyongyang. They also Thursday morning visited Mount Baektu, a sacred mountain that borders China and is said to contain the history of ancient Korea. Moon and his wife spent a lot of time with Kim and his wife during the trip to Mount Baektu, considered the most sacred and symbolic mountain of the Korean nation. Moon had said repeatedly that it was his longtime dream to trek up Mount Baektu. 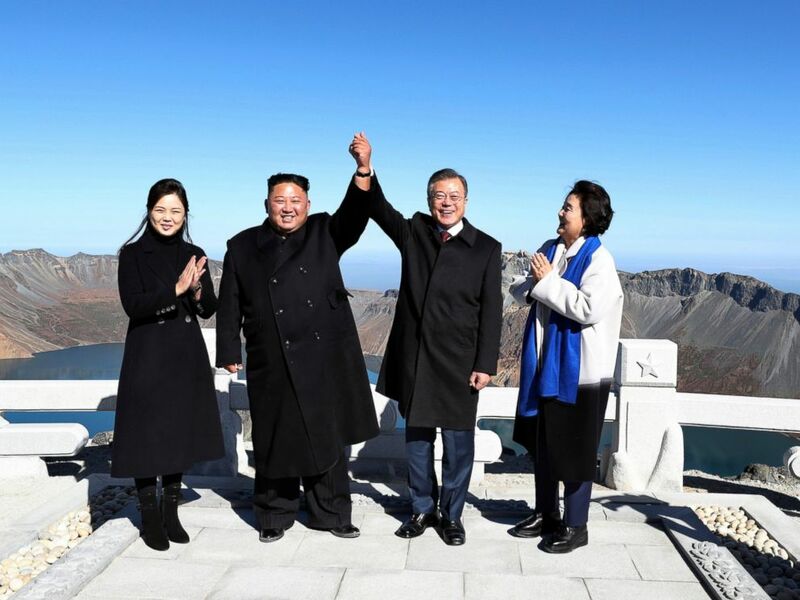 The South's presidential office announced Wednesday that the two leaders' visiting Mount Paektu represents the "80 million Korean people combined." Moon left early Wednesday morning from Paekhwawon guest house and was escorted by Kim Yong Nam, head of North Korea's parliament. Tens of thousands of Pyongyang citizens lined the streets, again dressed in colorful national costumes, waving flowers and peninsula flags and North Korean flags high in the air. Moon Wednesday night gave an emotional speech in front of 150,000 North Korean citizens at Rungrado 1st of May Stadium. It was the first time a South Korean head of state ever addressed North Korean citizens directly. South Korean President Moon Jae-in, second from right, and his wife Kim Jung-sook, right, stand with North Korean leader Kim Jong Un, second from left, and his wife Ri Sol Ju on the Mount Paektu in North Korea, Thursday, Sept. 20, 2018. "I propose to take the next big leap to completely resolve the 70 years of hostility and be together as one again," Moon said. "Chairman Kim and I will rebuild our nation, with 80 million people of the North and South holding hand in hand, standing strong." The speech came after watching the welcoming Mass Games, which were modified from its original version for the South Korean delegation. The audience, in typical North Korean style, gave a standing ovation. "President Moon almost cried giving the address in Pyeongyang," Herry J. Kanzianism, director of defense studies at the center for the national interest, said during a specialist discussion session at Seoul Press Center. "He seems sincere in trying to end problems in the Korean peninsula. We need to give him big credit for engaging in such difficult challenge." 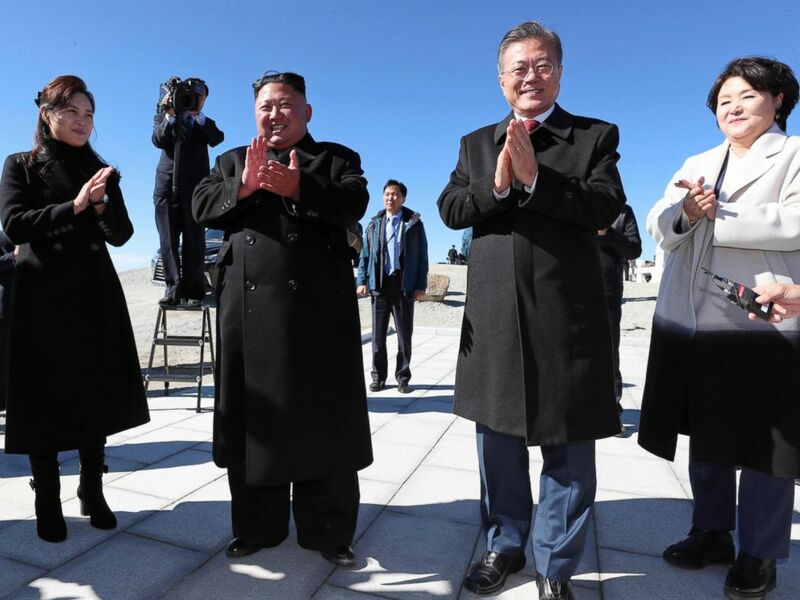 South Korean President Moon Jae-in, second from right, his wife Kim Jung-sook, right, North Korean leader Kim Jong Un, second from left, and his wife Ri Sol Ju clap hands on the Mount Paektu in North Korea on Thursday.